Before Andy and I bought our little house by the lake, I used to live in an even smaller abode which would be best described as teeny tiny. My first apartment (après college roommates and pre husband) was a junior one bedroom apartment on the 17th floor of an apartment highrise on the subway line for the approximate price of a new kidney each month. I fell in love with the amazing 360 degree lake, park and city views and didn't think about it's 530 square feet of tiny space... including the outdoor balcony space. Upon signing the papers, I promptly made two new purchases; a queen size bed and a sectional couch and had them delivered on move in day. The rest was a mishmash of my meager possessions mixed and matched with all kinds of thrift store and second hand finds. I immediately bought a pretty chandelier off of Craigslist to replace the standard flush mount light fixture. 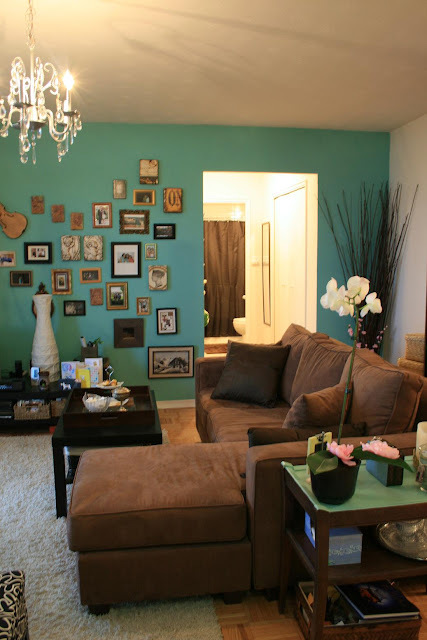 I then put up simple Ikea curtains, laid down a white shag rug, bought a large coffee table (since space was limited and I needed a table that would work both as a dining table or work table if need be) and painted one wall a beautiful robin's egg blue. What a feature wall it was. I still dream about that soothing shade of sophisticated blue, and am dreaming up of ways I can paint a room in our current house that colour. Large billy bookcases helped with my storage needs and helped make the space seem larger by drawing the eye upwards. Baskets of all sizes helped corral all of my stuff and I pared down my clothes to fit into the tiny closet space. I felt so lean, and I'm definitely not talking about my body fat percentage. I loved that place and I learned a lot about my own decorating tastes and needs. I followed a few key steps and never felt like my place was too small. Keep your walls white, but paint one feature wall a bold colour. This will help add interest and sometimes a darker color on one wall can make it look like it's receding, making the space look larger. Use large furniture to balance out the space. Having too many small pieces of furniture can actually make a space look cluttered and block traffic flow. Don't cram too much furniture into a small space. Think hard about what you actually use and need. A sectional couch with armless seating can be more functional, create an open feel and reduce visual clutter. It also allowed me to have someone over and sit across from them as opposed to having an awkward conversation sitting side by side. Keep window treatments simple. Large billowing fabric can take up space and cover much needed light, with a small space, always think light, bright and airy. Great lighting is a must. Chandeliers draw the eye up and disperse light evenly. Go vertical and use the space all the way to the ceiling. Shelves, art, chandelier, anything to draw your eyes up. Unless you're really starting with a blank slate, take out something old for everything new you bring in. Don't hang onto stuff just because they might someday come in handy. Keep the place clean! Everything should have it's own place to keep clutter and claustrophobia at bay. Have fun and be creative. Don't be afraid to mix and match all the things you fall in love with, but know when to draw the line. Buy only the items that you absolutely love and refuse to let anyone give you their junk (unless you love what they're passing along).